The hills of Central Travancore in southern Kerala were opened up in the 1860s following the trails blazed by the missionary Henry Baker. At that time the hills were only inhabited by jungle tribes. The Reverend Henry Baker came to the princely kingdom of Travancore in 1819 on the invitation of Col. Munro, the British Resident at the Court of Travancore to help set up a seminary for Syrian Christian priests. Later, Mrs. Baker established the first school for girls in Travancore, and three of the Bakers’ six sons were pioneer planters in the Peermade hills. In 1862, the Bakers acquired land in Peermade and began clearing. The first commercial crop planted was coffee and for several years, planting in Peermade was a family affair between the Bakers and the Munros who had inter-married and became one large extended planting family. Coffee seed and seedlings came from Wyanaad along jungle trails. It was 1872 before the cart road between Kottayam and Peermade was opened and 1885 when the Peermade-Gudalur stretch was opened. Hardly had coffee started flourishing in Peermade when it was threatened by the leaf disease (HemiliaVastatrix) first seen in Ceylon in 1868/89. It struck Peermade in 1875 and by 1886 only 12 planters remained in these hills. As the blight spread, experiments began to find a substitute crop. Cinchona, tea, cardamom, rubber were tried and soon it became evident that tea was best suited to the Peermade elevation. The seed came the Nilgiris and were of the indigenous Assam jat. By 1906, there were 8000 acres under tea in Central Travancore and only 500 acres of coffee. The United Planters’ Association of Central Travancore received an award of Honourable Mention for the tea showcased at the Paris Exhibition of 1900. As coffee changed to tea, costs also changed. Coffee land was cheap – coffee is best grown under shade, while for tea the entire land has to be clear-felled –cultivation and manufacturing were comparatively simple and seasonal labour was adequate. At the same time, the British Companies Act of 1862 encouraged the replacement of old family firms by joint stock companies and salaried managers. In 1897, the first major company made its appearance in the Peermade-Vandiperiyar area, the Travancore Tea Estates Company (TTE), founded by Mr H M Knight, a pioneer planter in the area. Mr Knight served as co-Chairman of UPASI in 1904-05. By 1914, the TTE had eleven different properties in the region, and the Managing Director was Mr H K Rutherford, and the General Manager was Mr D McArthur, who resided at the Tungamullay tea estate. Each estate maintained a separate account of the work carried out. Practically the whole of the land consisted originally of dense virgin jungle which had not been cultivated earlier. “It was therefore, a task of no ordinary character, with which the original manager, Mr H M Knight was confronted, but his ripe experience, coupled with the determination to succeed, has placed the company in a foremost position amongst the tea-growers of Southern India. The initial expenses were heavy indeed, as the task of clearing the land, of equipping the several properties with bungalows, quarters for coolies, factories and machinery, and general development, including the making of roads, was completed at a costs of not less than £ 25 per acre. 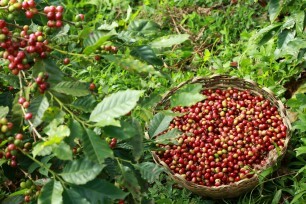 The growing of coffee received a decided check a few years ago when the disastrous ravages of the leaf-bug cleared off many of the most promising plantations, and it is only in certain districts, and at an altitude of about 3,500 to 4,500 feet that the risk of planting bushes is now undertaken. 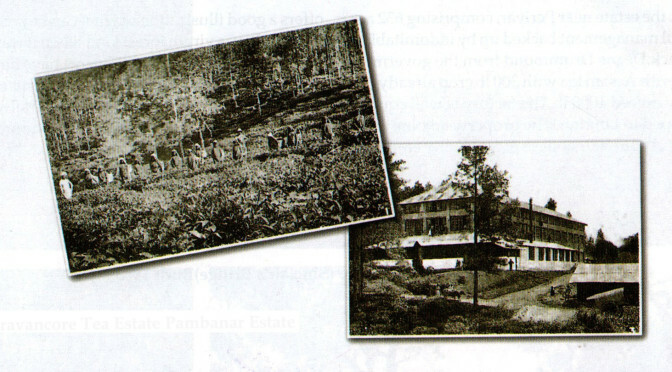 The Pambanar Estate of 1148 acres, was planted with 140 acres of coffee and about 60 acres of tea when it was acquired by the company, but the coffee was uprooted and the cultivated portion of the property now consists of 621 acres of tea in full bearing, and of 38 acres of immature trees. All tea is of the indigenous kind with the exception of the original 60 acres of the hybrid type. The remaining 489 acres will be cleared and cultivated for a similar crop as soon as circumstances permit. A yield of 650 lb. is generally secured, and the tea, which is prepared on the property, is shipped to London through the ports of Cochin and Tuticorin. The fine factory – 140 ft. in length – has been fitted with up-to-date plant, which is driven during the eight rainy months of the year by a turbine fixed on a dam built across the River Pambanar, while a 32-h.p. Crossley oil-engine is used during the remaining four months. A European manager is resident on the property, and about 750 coolies are regularly employed. Pambanar is two miles distant from the post and telegraphic offices in Peermade; it lies at an elevation of 3,400 ft. and it has an annual rainfall of 130 in. There were about 90 acres of hybrid tea-bushes on the Granby Estate of 298 acres when it was acquired by the company, but the whole of the remaining ground has since been sown with seeds of the indigenous kind. Numerous buildings have been erected on the property and the factory contains all the necessary plant for the process of manufacture including an 18-h.p. oil-engine by Crossley. Cases of made tea are marked with the estate brand, and are shipped direct to London via Tuticorin. The excellent average yield of 650 lb. to the acre is undoubtedly due very largely to the systematic manner in which the soil is periodically manured. Coolies to the number of 250 are required constantly, and their work is under the careful observation of a resident European manager. Granby is five miles distant from the post and telegraphic office at Vandiperiyar. The Munjamullay property of 1,024 acres is part of an estate of 2,340 acres which was purchased in 1896, and then divided into four portions, the remaining three named Injikadu, Nellikai and Pasumallay, being described separately thereafter. This group is situated in the Periyar Valley, through which flows the river of the same name, and as all the land was heavily timbered at the time of purchase, a heavy expenditure was necessary before actual cultivation could be commenced. Portions of the property were planted in 1898, but no further development was possible between 1899 and 1906 owning to the prevalence of malaria. Munjamullay had 299 acres of indigenous tea bushes in 1898, and when Mr McArthur assumed control in 1906 he planted 84 acres of rubber in order to obtain a suitable encampment for his coolies. These trees have flourished remarkably well, and although they grow more slowly at an altitude of 3000 ft. than those at a lower level, an extra year at arriving at maturity is compensated for by an increase in the thickness of bark. 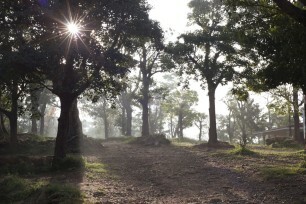 There are further on this property 309 acres of tea-bushes in full bearing in addition to 204 acres of younger ones. Although manure has not be applied, the average yield of tea is about 800 lb. to the acre, while some of the field have given 1400 lb. Modern plant has been obtained for the factory and the machinery includes a 32-h.p. Crossley oil-engine and a 10-h.p. National oil-engine for cases of emergency. A European manager resides on the estate and he has the services of an assistant and about 550 coolies. Munjamullay is 85 km distant from Kodaikanal Road railway station, and the Vandiperiyar post office is situated on the property. The Injikadu plantation, which is worked in conjunction with the Munjamullay estate, is 252 acres in extent, and it is situated half a mile from the post office at Vandiperiyar. About 53 acres were planted with tea in 1898, a further area of 187 acres was opened up in 1906 and application is now being made to the Government for an additional 260 acres in order for the property to be large enough to be cultivated separately. The young plants are only now approaching maturity, but the older trees give an average annual yield of about 750 lb. to the acre. A factory will be erected when the grant of further land has been obtained. There is a very comfortable bungalow for the resident superintendent, and suitable accommodation has been provided for the 200 coolies who have been employed. Nellikai, a property of 523 acres, had 52 acres of indigenous tea-bushes planted in 1898, and a further area of 392 acres has been developed since that date. The yield is about 550 lb. to the acre, and the crop is sent to the factory on the Munjamullay estate to be manufactured. It is proposed to erect a factory during the year 1915, when the chests of “made” tea will be consigned to Tuticorin for shipment to London. The buildings now on the property include a bungalow for the assistant manager, and suitable lines for the 350 coolies. Nellikai is situated on a main road about one mile from Vandiperiyar; it is at an altitude of about 2,600 ft. and it has an annual rainfall of about 85 in. Pasumallay comprises 541 acres. When Mr McArthur became manager of the company, he planted 140 acres of this property with rubber, but two years later a herd of elephants made its appearance and raided the plantation with such effect that only about 35 trees were left out of a total of 27,000. The land which was thus cleared was forthwith put down to tea, and the estate now consists to 35 acres planted in 1898, and of 338 acres which have grown since that date. The oldest bushes return about 800 lb. to the acre, though some of the field have yielded as much as 1,400 lb. An excellent factory – built in 1913 – has been fitted with approved machinery and plant of a thoroughly modern character, and the motive power is obtained from a 20-h.p. Crossley oil-engine. The chests of made tea are marked with the station brand, and are then shipped to London at the port of Tuticorin. Mr McArthur has established a nursery – 20 acres in extent – at Pasumullay where tea-plants required for the plantations on all the estates are reared. This land is irrigated by water which is pumped by machinery from the Periyar River. An assistant-superintendent who resides in a neat bungalow on the estate, has charge of about 350 coolies. There are a number of stones in the Thengakal River, near Vandiperiyar, in the district of Travancore, which greatly resemble coconuts, and thus it came about that the name Thengakal was bestowed upon the estate that will be noticed next. Coffee was planted here in the early seventies (1870s) and this property and the adjoining one of Thathekanum are said to hold the record for the highest yields in Southern India, the crop being no less than 2 tons of dry coffee to the acre in a single season. These two properties – upon which 94 acres of indigenous tea had been planted – were purchased in 1896 and since that time they have been cultivated under one management and under the name of Thengakal alone. A very serious epidemic of malaria caused the company to abandon the estate in 1900 and it was not until 1911 that possession was retaken. About 330 acres are producing tea of first class quality; in fact the Assam jat in the 94 acres originally sown is said to be equal, if not superior to any other jat in Southern India. The factory is fully equipped with machinery, which include a 20-HP Crossley oil engine. The superintendent in charge employs some 400 coolies. Thengakal has hitherto not been in a desirable position with regards to communication, as the best available route has been a bullock cart track which is 7 miles from Vandiperiyar. The cost of the road and the bridge over the Letchmi River under construction is borne by the Company. The estates are from 2500 to 3300 feet and have well-distributed rain of about 125 inches. The various estates owned by the company are 6,999 acres in extent and application has been made to the government for another 815 acres. About 5219 acres have been opened up to the present time and 3613 acres are occupied by trees in full profit. More than 200 acres of the total have been developed since 1906, but the greatest portion of the work has been done since 1909. The company has had its full share of difficulties, but there has been efficient management on the part of Mr McArthur and his assistants, and the days of storm and stress have been succeeded by an era of marked prosperity.